At any given moment in Spain, there are thousands upon thousands of people surfing the Internet. But more and more Spaniards are opting for a kind of parallel Internet, one that avoids the high costs of commercial Internet Service Providers and bridges the digital divide. guifi.net [es] is a user-owned, open and neutral network in which a growing community of volunteers can connect their computers to form a sort of intranet and, at the same time, share an Internet connection. The non-profit network is free, minus any individual costs for networking equipment, and anyone is allowed to join and use it how they want. Currently, guifi.net has more than 22,000 working nodes [es], with the majority of them concentrated in the region of Catalonia along Spain's Mediterranean coast and the rest throughout the Iberian Peninsula, though several are as far-flung as Argentina, China, India, Nigeria, the United States and Yemen. Described as the world's largest mesh network of its kind, guifi.net began in the early 2000s as a way to bring broadband Internet to rural Catalonia, where commercial ISPs weren't offering connections. Co-founder Ramon Roca, an Oracle employee at the time, didn't want to have to make the long journey into Barcelona just for Internet access. Roca and other like-minded people behind the community-led effort made friends with local officials, who allowed them to place networking equipment on high vantage points such as church steeples, and guifi.net's reach slowly expanded further and further. No comparto en absoluto la idea de “ofertas variadas”. Es lo que algunos quieren hacer creer a la ciudadanía para disuadir a nuevos competidores, pero la realidad es que hay poca oferta, de mala calidad y casi obsoleta. I don't share the idea at all that there are “a variety of options”. That's what some want to make the citizenry believe to dissuade new competitors, but the reality is that there are very little options, and they are of poor quality and almost obsolete. Alternatives are still necessary in Spain, a country with lower rates of Internet penetration than the average in Europe. According to Eurostat data, 68 percent of homes had Internet access in Spain in 2012, well below the European Union average of 76 percent and putting Spain in the company of countries such as the Czech Republic, Croatia and Italy. Spain also has some of the most expensive broadband Internet connections in Europe, according to a study by telecoms watchdog Ofcom. guifi.net helps users split the high cost of broadband Internet by allowing a group of families, for example, to contract an ISP, set up a virtual private network (VPN), and share the connection through guifi.net. Local governments are also lining up to take advantage [es] of the network. Small municipalities like Avinyonet del Penedès, a town of just over 1,500 people in the southeast of Catalonia, and Cabanes [es], a town of about 2,900 people along the northern coast of Valencia, use guifi.net to bring Internet access to residents who normally wouldn't have it and support the network by installing supernodes that re-transmit the wireless signal. The grassroots effort has been so successful that it's moved beyond wireless and added physical fiber optic cables to its network. 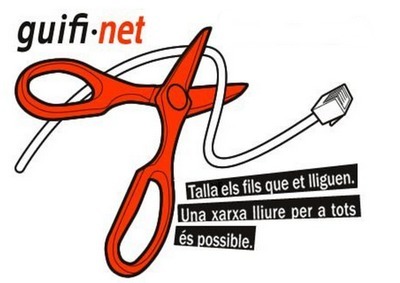 In 2010, guifi.net signed an agreement [es] with the regional government of Catalonia to bring Internet access to rural areas using fiber optic links, beginning in the small town of Gurb. The latest locale to hook up to the fiber optic network was the General Hospital of Vic [ca] earlier this summer, part of the effort to wire the area of Osona for Internet access. “The big companies aren't interested in doing it and the small ones aren't able to. Doing it among everyone […] is the best and only way,” Roca told El9Nou.cat news website. And earlier this year, Spanish bank Bankia donated three kilometers [ca] of fiber optic links – once belonging to savings bank Caja Laeitana, which the banking conglomerate has absorbed – in Mataró in Catalonia to guifi.net. I can’t help wondering, doesn’t a mesh network like this violate the contracts for the broadband internet access via ISPs? Because the telecom sector is liberalised in the EU, so everybody has the right to become an ISP and so did the guifi.net Foundation. Pingback: Here's a free gadget, welcome to the Sharing Economy.